Plants perennial, cespitose or not, long-creeping rhizomatous. Culms sometimes spaced to 3 cm apart, (5-)12-25(-55) cm, smooth. 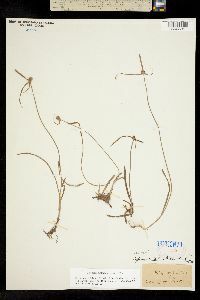 Leaves flat, 2-21 cm × 1.5-3.5 mm. Inflorescences: spikes 1-3, 4-7 × 4 mm; bracts 3-4, longest ± erect, others ascending to horizontal, flat, 1.5-18 cm × 1-3.3 mm. Spikelets (20-)40-60(-100), pale greenish or reddish brown, ovate, (2.2-)2.5-2.8(-3.2) × (0.6-)0.7-0.8(-1.2) mm; floral scales laterally 2-3-veined, elliptic to ovate, 1.8-3 × (0.8-)1.1-1.6 mm, midvein not winged, apex mucronate; stamens (1-)2; anthers 0.8-1.1 mm; style 0.6-1.2 mm; stigmas 0.5-1.5 mm. Achenes brown, substipitate or stipitate, ellipsoid to oblong-ellipsoid, 1-1.2(-1.3) × 0.6-0.8 mm, stipe, if present, 0.1-0.2 mm, apex obtuse to subtruncate, apiculate, papillate. Fruiting summer. Damp grasslands, shorelines, ditches, croplands; 0-200 m; Ala., Calif., Fla., Ga., La., Miss., N.C., Okla., S.C., Tex. ; Mexico; West Indies; Central America; South America; Asia; Africa; Australia. 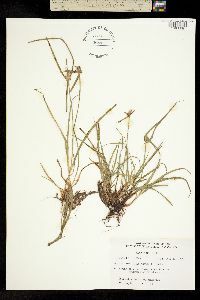 Reports of Kyllinga brevifolia from Connecticut, Delaware, Maryland, New Jersey, Pennsylvania, and Virginia should be referred to as K. gracillima.